The secret to the perfect pizza lies in the dough. And the secret to good dough lies in the yeast. Freshness is the key in cooking, and it’s especially true with yeast. Refrigerated yeast needs to come to room temperature before use. Water used in dough generally should be about 120-130o F/ 50oC. Kneading and rising are equally important. If you are trying to make a thin crust pizza, for example, you will find that you just can’t stretch the dough thin enough without putting in the time to knead the dough, and punching down during the rising to release the gas from the yeast reaction. Other expert suggestions include using a baking stone instead of a metal pizza pan, patting it with your fingers until it flattens evenly instead of using a roller, brushing olive oil on the crust but garlic oil on the crust edges and finally using a thick brush to evenly spread the sauce across the dough. Sift the flour in a large bowl and make a well in the middle. Use a measuring cup to mix the yeast, olive oil and sugar into the water, leave it for a few minutes and then pour it into the well. Knead until the dough feels smooth and your hands clean and flour-dusted. You may need to add some more flour in the process to achieve that. Cover the bowl with a damp cloth and let it rise for at least one hour by the end of which, it should have doubled in size. 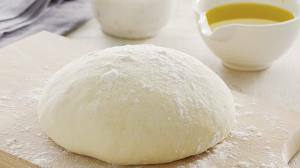 Place the dough in a flour-dusted surface and punch it down to push the air out. Use your fingers to flatten it evenly onto an oiled pan and let it rest for another 30 minutes before adding the ingredients for your pizza. 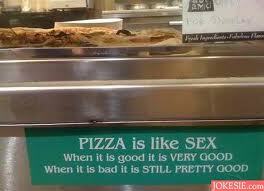 All the more reason to have homemade pizza.